Walt had always wanted there to be a New Orleans-themed section in Disneyland. Architectural elements from that city in the late 1800s were in evidence on buildings at the far end of Frontierland from when it first opened in 1955. In fact, Walt labeled one of the streets "New Orleans Street" and it was officially dedicated August 9, 1955 by actress Dorothy Lamour. It was a Tuesday to tie in with Mardi Gras (Fat Tuesday) and there was a Dixieland Jazz group that played along with other entertainers. "It looks exactly like the wonderful city in which I was born," said Lamour as she smashed a bottle filled with water from New Orleans against Lafitte's anchor that would be displayed for decades. 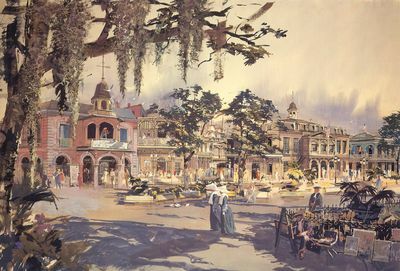 Imagineer Herb Ryman did a series of evocative concept paintings of the possibilities that inspired Walt to eventually build a separate New Orleans Square section in his park. New Orleans Square was the first new land ever to be added to the park. It was officially dedicated on July 24, 1966, by Walt and Victor Schiro, who served as mayor of the city of New Orleans from 1961-1969. 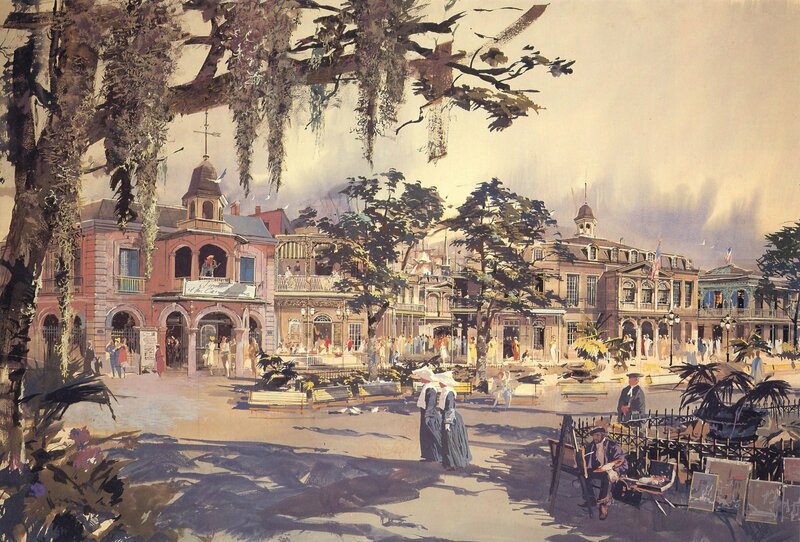 Herb Ryman's Concept Art for New Orleans Square. Why was it called New Orleans Square since it doesn't seem to be a square at all, but a series of curved, winding streets? The Vieux Carré is the historic name for the actual New Orleans French Quarter, and translates from the original French into "Old Square." A reporter for a New Orleans newspaper at the event wrote that "it's the next best thing to being there" and repeated the information from the Disney publicity material that it was built for almost the exact amount paid for the entire Louisiana Purchase in 1803, roughly $15 million, just $2 million shy of the cost to build the entire Disneyland park roughly 10 years earlier in 1955. At the dedication, Walt said, "Disneyland has always had a Big River and a Mississippi sternwheeler. It made sense to build a new attraction at the bend of the river, and so New Orleans Square came into being - a New Orleans of a century ago when she was the 'Gay Paree' of the American frontier." When Schiro repeated that the Disney version was just like the real thing to reporters, a playful Walt off to the side and in a soft voice said "only cleaner." Walt also joked that since the mayor had just made him an honorary citizen of New Orleans ("You know I am already a Louisiana Colonel," remarked Walt) that maybe he should make the mayor an "honorary dictator of the Magic Kingdom." While most Disney fans think of New Orleans Square as primarily the location of the attractions Pirates of Caribbean and Haunted Mansion, Walt was particularly interested in the shopping and dining experience that could be created. Robert Jackson and Frank Allnutt from WED (Walt Disney Imagineering) prepared a 12-page "profile" of the new land in 1966. It was obviously written prior to the opening of the land and notice how often Disneyland is referred to as the "Magic Kingdom." It was to be used by reporters who were writing for newspapers and magazines to better describe what guests would experience. Here are some excerpts from the document that helps give some idea of the feeling that the Imagineers under Walt's direction were trying to accomplish in the new land, as well as a glimpse as to what the original New Orleans looked like more than a half-century ago. I have also included some explanatory commentary when I felt it was necessary. She was the nation's most colorful and exciting city…a proud cosmopolitan center that had already established a lasting cultural heritage…America's capital of aristocracy…seat of commerce and industry…a bristling port exporting more commodities than New York. Cotton was king, and the Good Life was his decree. She was a city of contrasts. This was New Orleans in the mid-Nineteenth Century. Its unique atmosphere, drama and gaiety lives again in New Orleans Square at Disneyland. Walt Disney, the perennial innovator, has accomplished another "first" with the charming shops in Disneyland's New Orleans Square. He has made the "Magic Kingdom," world famous for its family entertainment attractions, the destination for collectors of the finest creations by craftsmen and artists from many eras and nearly every area of the world. Merchandise to suit every taste and budget has made New Orleans Square truly an adventure in shopping. From mosaic thresholds to chandeliered ceilings, from nostalgic stain glass panels to delicate wrought-iron lace, from fine old furniture to delicate bric-a-brac, these shops offer visitors settings of unequalled luxury and atmosphere. As its name indicates, this Shop features unique items to delight the most discriminating eye -- decorative and hard-to-find-antiques, choice reproductions and other ones-of-a-kind that would have been found on the shelves of shops in New Orleans decades ago…and are irresistible to today's collector. Guests may choose from a ceiling full of magnificent chandeliers or every description or a parade of select desks, cabinets and other products of the wood-craftsman's art. They will also find exquisite ship models, iron lanterns, old world globes, maps and charts, swords and antique framed paintings. Other items are candelabra, fireplace fixtures, and door knockers, as well as barometers, wood carvings, china, silverware, crystal pieces and other one-of-a-kind items. A blue and dark rose terrazzo floor complimented by luxurious wood-paneled walls provide the perfect setting for this Shop's collection. Here is a paradise for culinary artists. Even the most discriminating chefs and connoisseurs find their every wish granted in this colorful New Orleans Square Shop. Select kitchen accessories, equipment and utensils, along with exotic herbs and unmatched spices from Spice Island, are displayed on choice old spice chests, breakfronts, cupboards and tables that also available for purchase. Among the hundreds of items displayed against a setting of brick walls, beamed ceiling and handmade terra cotta floor are duck presses, tea pots, measuring cups, saltcellars, and pepper mills, espresso pots, demitasse cups and spoons. There are also chocolate cups, soufflés, casseroles, shirring dishes, wine hebers, pastry wheels, samovars, warming stands, tureens and all types of pots, pans and cooking utensils. The Parfumerie offers the ladies an array of scented items for the boudoir and bath. A perfumer will blend special fragrances to compliment a guest's personality, complexion and type. Choice gifts in dramatic stained glass --- some rare antiques, others made to order by the shopkeeper -- are featured in this charming Shop sponsored by Hollander Glass. It also offers other types of gifts suitable for all occasions. Decorators have combed the world for unusual stained glass objects d'art – window panels, lamp shades, and bric-a-brac -- to fill the shelves and showcases. A number of important elements have been borrowed for New Orleans Square from the old New Orleans scene. Artists in corduroy smocks, sandals and black berets set up their easels in all of the New Orleans Square courtyards where they paint portraits of guests. Surrounding them are previously painted New Orleans scenes in oil, tempera or casein, which guest may purchase. Delicate flower baskets and small floral arrangements can be purchased from gay flower carts. Brightly costumed vendors sell handmade fruits and vegetables. New Orleans Square would not be complete without candy and nut carts, which are parts of the street scenes. Famous Louisiana pralines, mints, pecans and other delectables are found in these carts. Delicacies that made the Queen City of the Delta the world capital of fine cuisine make New Orleans Square restaurants irresistible to all diners -- those in search of a complete gourmet meal or quick but unusual snacks between visits to the many offerings of New Orleans Square. Realizing that half of a good meal is the atmosphere surrounding it, Walt Disney and WED Enterprises staff have re-created the splendor and drama symbolic of the South's most historic city. At the Blue Bayou Restaurant, Walt Disney brings to "Magic Kingdom" guests the romantic enchantment of early evening dining on the moonlit terrace of a Southern colonial mansion overlooking the beautiful Blue Bayou Lagoon. Here at the Blue Bayou Restaurant, time "stands still" as an ever-present full moon spreads its glow over 200 guests enjoying Dixieland entertainment and elegant dining in the Southern tradition. The menu offers such Delta delicacies as clam chowder, salade chiffonade, baked ham, Southern fried chicken, French sandwiches, crab meat and shrimp. Desserts include French pastries, éclairs, rum baba, pecan layer caker and rum and raisin ice cream. The famous Dueling Oak, moss-draped trees, a columned arbor walk leading to the boat landing and the veranda of a dignified plantation house are bathed throughout the day in the tranquility of a Delta evening. And along the bayou are also Laffite's Landing, weatherworn swamp shanties perched on stilts, aging fishing boats and decaying brick archways – all echoing the mysterious sounds of the bayou country. Wrought iron furnishings and candlelight contribute to the Louisiana, 1850, flavor of the Terrace. And in the foyer, paneled walls, a pair of 19th Century Sheffield plate wall sconces and a terrazzo and marble pattern with brass inlay floor enhance the interior of the mansion. All of the nostalgia and excitement of New Orleans' old French Market is combined with dining and dancing beneath the multi-color canopy of the terrace of New Orleans Square's largest restaurant, The French Market Restaurant on Esplanade Street. Seating 250 guests at one time on the terrace, the restaurant serves guests at twin buffets – a technique which has proved highly successful in the Plaza Inn Restaurant on Disneyland's Main Street Plaza. A dessert buffet is conveniently available to guests inside the building and on the terrace. During the evening hours on the dining terrace, a gazebo by day becomes a bandstand where an ensemble plays music for dining and dancing. Inside The French Market Restaurant, accents of ochre and green, a quarry-tile floor and a unique "pressed-tin" ceiling, typical of that period, combine with arched murals to add a special charm to New Orleans Square. A "domed skylight" illuminates the two ceramic tile murals depicting historic scenes of ceremonies at the Louisiana Purchase in 1803. Guests enter The French Market across a mosaic threshold. Punctuating the walls surrounding the murals are memorabilia of French kitchens, including polished pots and pans, cleavers, weights, duck presses, grinders and baskets, which were sought by the Disney staff over a period of years especially for New Orleans Square. The flavor of an intimate New Orleans coffee house is captured in this restaurant's beamed ceiling, old stained glass, natural brick walls with panels of mahogany, and marble-tile floor. Waitresses in The Creole Café serve ice cream and coffee to guests seated inside at round, oak-top tables, based on a 19th Century style. On the terrace, guests at mosaic-topped tables under colorful umbrellas can enjoy their refreshment while taking in the panorama of Esplanade Street in New Orleans Square and the quiet cruising of the sailing ship Columbia and the Mark Twain stern-wheeler on the calm waters of the Rivers of America. The rest of the profile for the area is similar in tone in trying to create a sense of elegance that would once again set the Disneyland experience apart from the typical amusement parks. It was Disney's first attempt to control and theme the dining and shopping experience for guests that later evolved into areas like Disney Springs. Disney was trying to define an area not just by the attractions but by everything else that would contribute in creating an overall immersive feeling for the location.